In their native lands, camels feel by far the presence of a fountain or river. They never forget the place where they have found water. A camel's thick coat maintains an insulating layer, and it also reflects sunlight. A shorn camel has to sweat 50% more to avoid overheating. It also insulates them from the intense heat that radiates from hot desert sand. Their long legs help by keeping them further from the hot ground. There are 17 million camels worldwide. 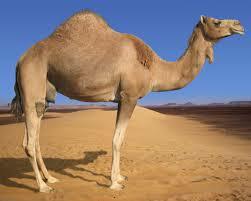 90 % are dromedaries or Arabian camels (with one hump) and 75 % of the dromedaries are found in North/East Africa. 50 % of the world's dromaderies are found in Sudan and Somalia, in semidesert areas. 15-20,000 bewildered dromaderies roam western and central Australia. When a camel uses the fat stored in its humps for energy, the humps start to get smaller and deflate. The humps grow again when the camel rehydrates. Camels make the most of a meal. They can rehydrate faster than any other mammal, able to drink about 30 gallons (113 liters) of water in just 13 minutes. Camels can run up to 40 mph for a short period of time. They can maintain 25 mph for longer making them about as fast as a horse. Humans have used camels as a means of transport for thousands of years. They are known for being able to survive for long periods without food and water while carrying around 500 pounds on their back. The large beasts of burden stand around 5.9 to 7.5 feet (1.8 to 2.3 meters) tall and can be 7.4 to 11.3 feet (2.3 to 3.5 meters) long. They typically weigh 660 to 1,520 pounds (300 to 690 kilograms) at adulthood. They live between 40 to 50 years. One of the worst habits of the camels is spitting. A distressed camel will spit a fetid stream coming from its first stomach chamber, especially when angry, frustrated or spooked, a real chemical bomb. Camels avoid stony deserts, as the gravel harms their feet. Julius Caesar considered the greatest war catch after the defeat of the Numidian king Juba's camels. (Numidia is today northern Algeria). In 363 AD, general Romanus asked as a war tribute to the dwellers of the city Lepcis Magna (today Libya) 4,000 camels, for the transport of his army. In 2005, scientists discovered in Syria a fossil dromadery species twice the size of the modern species. Camel milk is the basic food of the Somali people, and many nomad tribes of the desert depend on the camels, like the Tuaregs of Sahara and Arab Bedouins, for transporting, milk, meat, wool (1.5 kg fro a dromadery, 4.5 kg fro a Bactrian camel) and leather. In Mongolia, the Bactrian Camels offer the hair from which the felt, the material for traditional yurt tents, is made. Camels are known for spitting on people. In fact, the animals are throwing up the contents of their stomach along with spit. This is a defense tactic when the animals feel threatened. The large beasts make a variety of moans, groans and deep, throaty bellows. One of the camel's noises was even used to voice the character Chewbacca in the Star Wars movies. Camels have very thick lips allowing them to eat even very salty, bitter or thorny plants. If hungry, camels can even eat leather shoes. Camels are sexually mature at about 4 years old. Females reproduce till 30 years old, delivering one offspring at two years, and even more if food is abundant. Camel meat is taboo for the Non-Muslim populations of the Middle East and North Africa: Jews, Egyptian Copts (Christians), Zoroastrians (Iran), Mandaeans (Iraq, Iran), Neo-Assyrians (Syria, Iraq, Turkey), Ethiopians (Christians), while for Muslims in Egypt and other countries of Near East, basturma (salty camel meat) is considered a delicacy. Camels can withstand at least 20-25% weight loss due to sweating (most mammals can only withstand about 3-4% dehydration before cardiac failure due to the thickened blood). The oldest known camel is Protylopus, appeared 40-50 million years ago (Eocene) in North America. It had the size of a rabbit and lived in forests. Later, camels spread to the savanna and increased their size. In Oligocene, 35 million years ago, Poebrotherium had the size of a roe deer, but already resembled a camel.